It's 1773, and your name is Peter Pond. You've just gotten a letter from a gentleman in New York, Felix Graham. He wants to go into trade with you as his partner. You'll each put in £705 to buy a boat, crew, and goods to trade. Then you'll split any profits 50-50 at the end of one year. Since he lives in NY, he'll be in charge of getting trade goods from Europe and selling the furs at the end of the season. With your background as a British soldier, you are the perfect man to travel deep into the wilderness and trade with the First Nations people. Your plan is to travel from Quebec to Michilimackinac to the Mississippi River to the Minnesota River, and on to the Great Plains. You'll winter with the Dakota as a trader. You can buy your food from them. In the spring, you'll travel back to Quebec with your furs. Some men have gotten very rich on the fur trade. Others have been killed or maimed for life. Are you ready to risk everything for the chance of a brighter future? A canoe, including men, wages, and supplies for a year costs £166. One birchbark canoe holds 4 tons, or 8,000 pounds. Trade goods are packaged in 90-100 pound bundles. You can fit 60 bundles into one canoe. Do you want to use one or two canoes? Each canoe will hold up to 60 bundles. Click on trade items to load them into your canoe. There are five different types of goods for sale: guns, rum, tobacco, metal goods, and dry goods. Borrowed money will show up as a negative number on the dashboard. Click BUY to add kegs of rum to your inventory. Type in how many you want and hit OK. Click NEXT to return to the inventory screen. You are limited to 60 items total per canoe. About Rum and High Wines The First Nations or Anishinaabeg people had never experienced alcohol before Europeans came to their territory. Many of them react badly to rum and other liquors. Sales of rum to Natives results in alcoholism, fights, and deaths in Native communities, which is why the French government made laws restricting the sale of rum and high wines to the indigenous people. The Anishinaabeg cannot make alcohol on their own. Many of them want it very badly, but they can only get it from traders. This means the demand for rum is high, so the price for rum is also very high (this is the law of supply and demand.) You can make a lot of money selling rum to people for furs. But are you willing to sell something that is so damaging to people and communities? The canoes are loaded upriver of the Lachine rapids, just west of Quebec. Click BUY to add guns, gunpowder, and lead to your inventory. Type in how many you want and hit OK. Click NEXT to return to the inventory screen. You are limited to 60 items total per canoe. About Guns The Anishinaabeg greatly value guns and gun supplies such as bullets and gunpowder. Guns are used for survival in hunting and fighting off wild animals and hostile people. A tribe without guns is at a serious disadvantage when their enemies all have guns. A gun is usually worth 10 beaver pelts. About Tobacco Tobacco is another highly prized commodity. Many native tribes such as the Ojibwe use tobacco as part of their sacred ceremonies. Voyageurs, who crew the canoes, also use tobacco. They paddle furiously for miles, stopping every hour or two to smoke a pipe. They get a break long enough to smoke one pipeful of tobacco. Distances on the river are often measured in “pipes.” You can sell tobacco both to the Anishinaabeg and your own men. Click BUY to add bundles of tobacco to your inventory. Type in how many you want and hit OK. Click NEXT to return to the inventory screen. You are limited to 60 items total per canoe. Click BUY to add bundles of dry goods like cloth, blankets, beads, and clothing. Type in how many you want and hit OK. Click NEXT to return to the inventory screen. You are limited to 60 items total per canoe. Click BUY to add bundles of metal goods like pans, knives, needles, flint and steel, and bells. Type in how many you want and hit OK. Click NEXT to return to the inventory screen. You are limited to 60 items total per canoe. Peter Pond Ex-British soldier 1773 Pool savings with a partner to buy inventory, will split the profits 50-50. Jacques Legardeur de Saint-Pierre French Captain in charge of Fort Michilimackinac 1748 Split profits with 3 partners. Alexander Henry the Elder British trader 1761 Use a loan to buy inventory. Must pay back loan plus interest at the end. Marguerite Chaurette Traveling with her husband, Simon Chaurette, who works for the XY company 1803 Daughter of Kishkemun, founder and chief of Lac du Flambeau band of the Ojibwe. Charles Jean Baptiste Chaboillez French Canadian son of a voyageur 1797 Use both savings and a loan to buy inventory. Must pay back the loan plus interest at the end. It's 1748, and your name is Jacques Legardeur de Saint-Pierre. Due to your outstanding work in the army, you’ve been promoted to Captain and put in charge of the essential Fort Michilimackinac, on the Straits of Mackinac. Trade from all over flows through your fort. Your job is to command the army post, go fight when necessary, and protect the fort and the trade goods stored there. Officially you are not allowed to engage in the fur trade. In reality, you are a well-known and influential man. You’ve secretly formed a trade partnership with Francois Bigot (a top French government official), Jacques-Pierre de Taffanel de La Jonquiere (Governor-General), and Meret (the Governor-General's secretary). Together you’ve pooled your money to buy inventory to sell to the Ojibwe and other tribes. You each put in £383. You’ll ship the furs you buy back to Montreal, and then send them to France for a huge profit. Be careful! No one can know about your secret trade deal. Split all profits with your partners. It's 1761, and your name is Alexander Henry. The French and Indian War has just ended. The British have taken over Canada and kicked out the French government. General Gage, the new chief commander in Canada, reluctantly gives you permission to head to Michilimackinac to trade. No one has made a new peace treaty yet with the Ojibwe, who are very loyal to their French friends. They are very likely to be hostile to you and other British traders. You are only the second man Gage has allowed to head into the Indian countries. Although the French government officials have left, the French Canadian and Metis voyageurs who have been working in the French fur trade remain, and you can hire some of them to crew your canoe. You don’t have enough money to buy an inventory to sell, but you have friends who will give you items on credit. You need to pay back your loan plus 10% at the end of your trip. It's 1797, and your name is Charles Jean Baptiste Chaboillez. Your father was a voyageur and a fur trader, so you are following in the family tradition. You’ve been a fur trader for many years. The Ojibwe are spreading farther and farther west. You’re planning to winter at the junction of the Red and Pembina rivers, where only one trader has wintered before. You’ve got £300 in savings from your previous years of trading, and you’ve also borrowed some money from McTavish, Frobisher, and Company. You’ll need to pay back the money you borrow, plus 10% interest. Are you ready to risk everything by heading into the unknown? It's 1802, and your name is George Nelson. You are 15 years old. This spring you went to Montreal and signed your indentures to work as a clerk for the XY company for 5 years. You’ll be paid 15 pounds a year. If you do well, at the end of your 5 years you’ll either get shares in the company or get paid 100 pounds a year. You have to prove yourself by doing a great job this year. This is your first time being away from home, and you are nervous. Out in the wilderness where you are going, it’s every man for himself. Can you survive this year and impress the boss? You will be traveling upriver, against the current, for over 1000 miles, until you reach the Continental Divide. The men dig their paddles into the water, pushing against the current, and you are off! As is tradition, you all stop at St. Anne's at the end of the island of Montreal. Everyone slips a few coins into the box in the church. St. Anne protects voyageurs, and the priests will pray for the safety of everyone who puts their money in the box. You travel upriver for several days. Often, you come to rapids, waterfalls, and narrow spots on the river that are impassable by boat. Then the men have to unload the boat and carry everything on their backs for several miles until they can put the boat back into the water and reload it. Rapids from Beth Wyman on Vimeo. Each man carries two packs, each weighing 90 pounds. He puts a strap around his forehead and rests the second pack on top of the first. Struggling over the rocky ground, he trudges about 1/3 mile before putting the packs down and going back for a new load. Sometimes the portage is short (3 to 5 trips), and the men can reach the river in one trip. Some portages take days to traverse. Paddling upstream, you’ve come to a waterfall. It’s impossible to climb the waterfall, so everything must be unloaded and carried around on land, including the canoe. Phew! You’ve made it to the end of the portage. It took a lot of time and energy to carry everything over the rugged terrain. The time and effort cost you food and life points. Paddling upstream, you’ve come to a waterfall. It’s impossible to climb the waterfall, so everything must be unloaded and carried around on land, including the canoe. Phew! You’ve made it to the end of the portage. It took a lot of time and energy to carry everything over the rugged terrain. Unfortunately, one of your men slipped while carrying his heavy load. He’s got an internal rupture, and is seriously injured. Lose food and life points for the time and injuries. You’ve come to some rapids. It’s not a waterfall, so it is possible to take the boat through the rapids. However, the water is fast and is running over lots of submerged rocks. It’s very risky to shoot the rapids. If you want to play it safe, you can take the portage and carry everything over land to the other side of the rapids. However, the portage is much slower and harder work and will cost you time and food. What do you want to do? It is 1803. Your name is Marguerite Chaurette, although many people call you Kinikinikinokwe, or Cree Woman. Your father, Kishkemun or Sharpened Stone, is founder and chief of the Lac du Flambeau band of the Ojibwe. You are traveling with your husband, Simon Chaurette, who works for the XY company. You are responsible for your wigwam and all your family’s goods and supplies. In Ojibwe culture, the husband owns only his weapons, while the woman owns the house, furs, and all the goods. Your daughter, Marguerite, is two summers old. Your marriage to a prominent fur trader means better trade deals for your husband and more goods for your family. You can help your husband as a translator and cultural interpreter, and you know all about finding food, medicine, and other useful things in the woods and streams. While you do not choose the trade goods for the canoe, your family’s well-being depends on your husband’s success as a trader. You will be asked to give your opinion about various trades along the way. There are 15 families on board this trip, and you are happy to have other women around and kids to play with your daughter. The canoes are loaded upriver of the Lachine rapids, just west of Quebec. There are 6 birchbark canoes heading to Grand Portage. Each has 10 men and 2 guides. They are very heavily loaded, so even the smallest movement makes them tip. You make sure your young daughter is secure as you all set off upriver. This portage has 22 resting places. The first 11 are uphill. At the top is a wonderful view. The second 11 are downhill, which in some ways is harder when your load is very heavy. You carry everything for your household - bag, kettles, pans, dishes, and cups as well as your young child. Since you are strong and can manage it all in one load, you can rest at the resting places while the men go back and forth getting extra loads of goods. You carry everything along the portage for 5 days. You are exhausted and glad to get back into the canoe. Lose food and life points for the time and effort. End free sample. Thanks for trying it out! To play the rest of the game, click the buy button below. Note: Everything in this game is real - all the identities, choices, and consequences actually happened. All text is scrollable. You’ll learn the most if you play more than once. The pictures will be the same, but the text and consequences will change each time you play. Tip: Keep an eye on your life and food points. 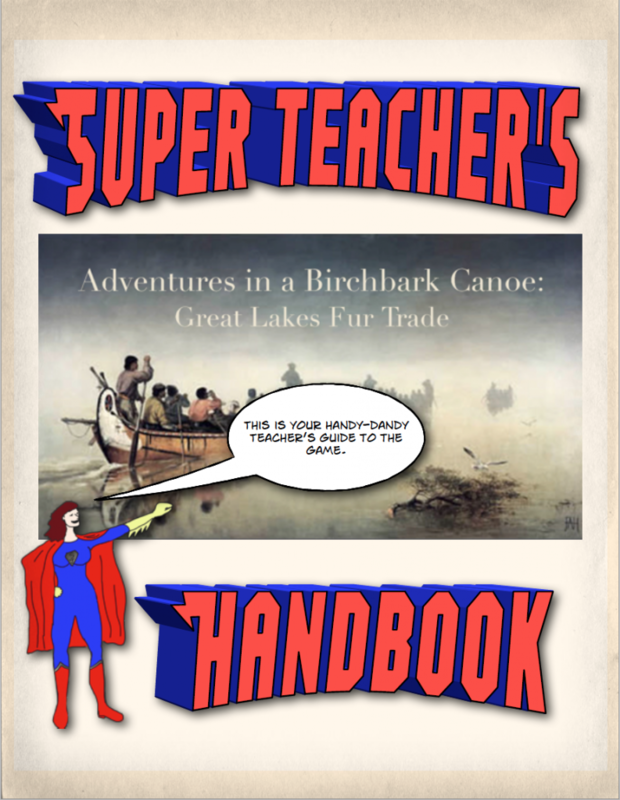 You can find the primary source reference for each game event in the teacher’s guide. Enjoy! Click BUY to add kegs of rum to your inventory. Click NEXT to return to the inventory screen. You are limited to 60 items total per canoe. Click BUY to add guns, gunpowder, and lead to your inventory. Click NEXT to return to the inventory screen. You are limited to 60 items total per canoe. Click BUY to add bundles of tobacco to your inventory. Click NEXT to return to the inventory screen. You are limited to 60 items total per canoe. Click BUY to add bundles of dry goods like cloth, blankets, beads, and clothing. Click NEXT to return to the inventory screen. You are limited to 60 items total per canoe. Click BUY to add bundles of metal goods like pans, knives, needles, flint and steel, and bells. Click NEXT to return to the inventory screen. You are limited to 60 items total per canoe. Here’s the teacher’s guide for this game.